The Mubadala Silicon Valley Classic lost one future Hall of Famer but gained another today. Maria Sharapova, who won the last of her five Grand Slam singles titles in the 2014 French Open, withdrew from the July 30-Aug. 5 tournament at San Jose State. "Unfortunately, I have been forced to make some very tough decisions at this point in my career when it comes to my tournament schedule," said the 31-year-old Sharapova, who owns a career Grand Slam. "I need to take care of my body and make sure I stay healthy. I look forward to coming to play next year." Sharapova, the 2010 runner-up at Stanford, has battled injuries since returning from a 15-month doping ban in April 2017. After winning her first-round match at Stanford last year, the right-handed Sharapova pulled out with soreness in her left arm. Sharapova reached the quarterfinals of the French Open last month but lost in the first round at Wimbledon to qualifier and fellow Russian Vitalia Diatchenko. Formerly ranked No. 1, Sharapova has dropped to No. 21. Another former world No. 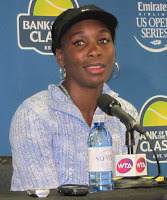 1, Venus Williams, joined the San Jose field. Williams, 38, claimed the last of her seven major crowns 10 years ago at Wimbledon. She was diagnosed with Sjogren's Syndrome, an energy-sapping disease, in 2011. Williams reached the Stanford final eight times, winning in 2000 and 2002, before the tournament moved to San Jose State under a new sponsor this year. She made her pro debut indoors in Oakland at 14 in 1994. The San Jose field also includes former Stanford champions Serena Williams (2011, 2012 and 2014), Victoria Azarenka (2010), Madison Keys (2017) and Johanna Konta (2016) and two-time Stanford runner-up CoCo Vandeweghe (2012 and 2017).